As we stride through 2019, we begin to notice some old school trends that are becoming relevant again. When it comes to interior design, we have the freedom to take inspiration from popular trends and mold them to fit our style. Which popular interior design trends will you make a part of your home this year? Have you noticed these #interiordesign trends that are making a comeback? Get inspired and have fun designing your new home, or revamping your current style! Which Home Design Trends Are Coming Back In 2019? It’s time to simplify your kitchen for 2019. White walls and solid colored kitchen cabinets will help you achieve that fresh, modern look. Make your kitchen counters the center of attention with gorgeous quartz countertops. They’ll never fail to make your kitchen look simply extravagant, and you can dress up your kitchen with your favorite accent colors to personalize it to your tastes. Having a neutral theme will give you endless options for adding geometric patterns and textures to your bathroom. A popular bathroom trend making its way back is all about the glamorous cultured granite showers and bathtubs. Matching your shower design with your bathroom countertops will turn your washroom into a serene relaxation space. Pro Tip: Aside from looking fantastic in any home, real quality stone surfaces are hygienic, durable, and easy to care for. Marble is suitable for any interior design trend. The great thing about a black and white theme is that it suits just about any room of any home. Imagine a customized white with black accented cultured marble fireplace surround as the statement piece to your living room. 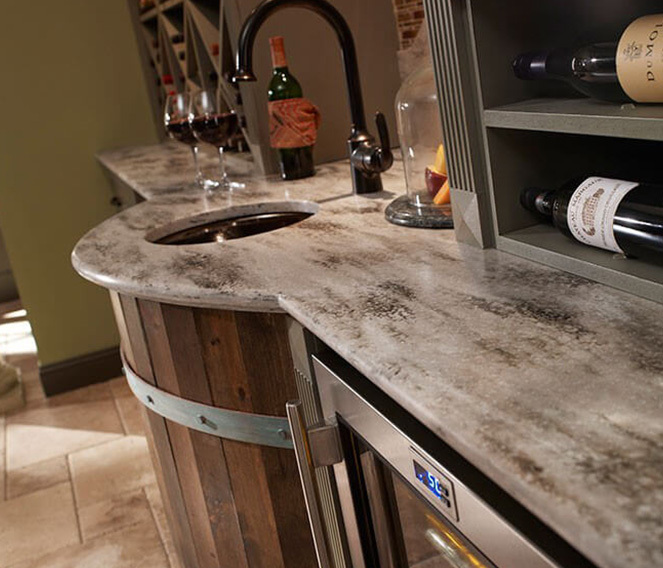 A matching wet bar would really bring it all together as well. With your black and white theme, you can add color and styled accent walls that will pop against your modernized living room. Take a look at all the home trends we’ve seen throughout the ages to get a good understanding of the look you desire for your home. Don’t be afraid to invest in quality home improvement after doing the proper research. Join the conversation for more interior design inspiration!